There are other gridworld Gym environments out there, but this one is designed to be particularly simple, lightweight and fast. The code has very few dependencies, making it less likely to break or fail to install. It loads no external sprites/textures, and it can run at up to 5000 FPS on a Core i7 laptop, which means you can run your experiments faster. A known-working RL implementation can be found in this repository. This environment has been built as part of work done at the MILA. 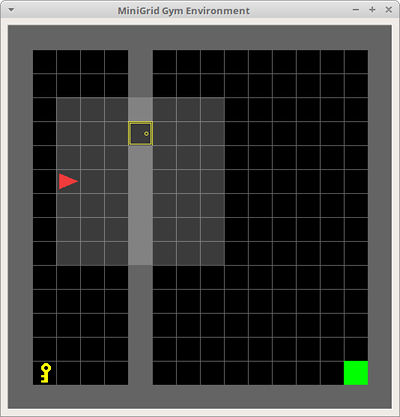 The Dynamic obstacles environment has been added as part of work done at IAS in TU Darmstadt and the University of Genoa for mobile robot navigation with dynamic obstacles. 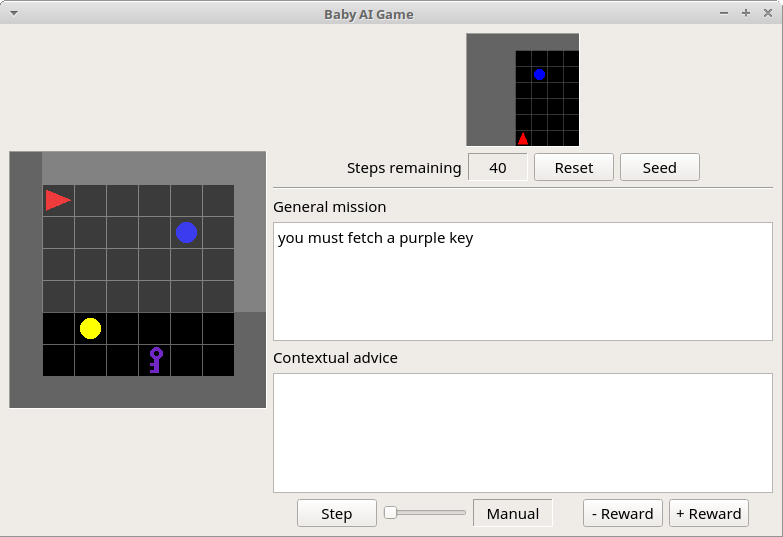 If you want to train an agent with reinforcement learning, I recommend using the code found in the torch-rl repository. This code has been tested and is known to work with this environment. The default hyper-parameters are also known to converge. MiniGrid is built to support tasks involving natural language and sparse rewards. The observations are dictionaries, with an 'image' field, partially observable view of the environment, a 'mission' field which is a textual string describing the objective the agent should reach to get a reward, and a 'direction' field which can be used as an optional compass. Using dictionaries makes it easy for you to add additional information to observations if you need to, without having to force everything into a single tensor. If your RL code expects one single tensor for observations, please take a look at FlatObsWrapper in gym_minigrid/wrappers.py. The partially observable view of the environment uses a compact and efficient encoding, with just 3 input values per visible grid cell, 7x7x3 values total. If you want to obtain an array of RGB pixels instead, see the get_obs_render method in gym_minigrid/minigrid.py. By default, sparse rewards are given for reaching a green goal tile. A reward of 1 is given for success, and zero for failure. There is also an environment-specific time step limit for completing the task. You can define your own reward function by creating a class derived from MiniGridEnv. Extending the environment with new object types or action should be very easy. 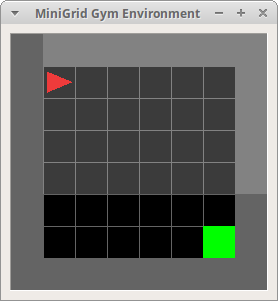 If you wish to do this, you should take a look at the gym_minigrid/minigrid.py source file. The environments listed below are implemented in the gym_minigrid/envs directory. Each environment provides one or more configurations registered with OpenAI gym. 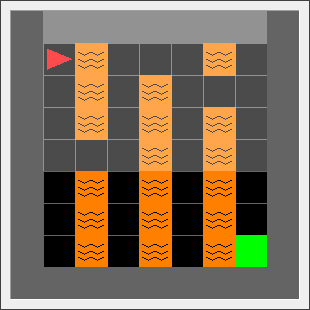 Each environment is also programmatically tunable in terms of size/complexity, which is useful for curriculum learning or to fine-tune difficulty. This environment is an empty room, and the goal of the agent is to reach the green goal square, which provides a sparse reward. A small penalty is subtracted for the number of steps to reach the goal. 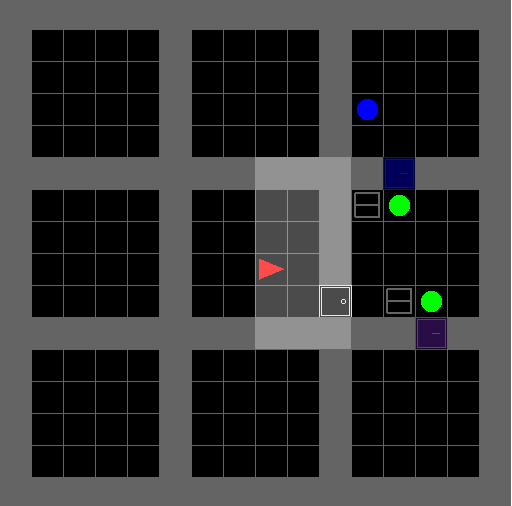 This environment is useful, with small rooms, to validate that your RL algorithm works correctly, and with large rooms to experiment with sparse rewards and exploration. The random variants of the environment have the agent starting at a random position for each episode, while the regular variants have the agent always starting in the corner opposite to the goal. 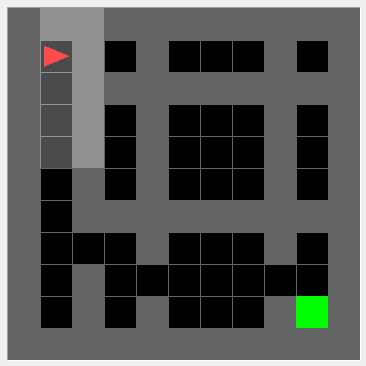 Classic four room reinforcement learning environment. 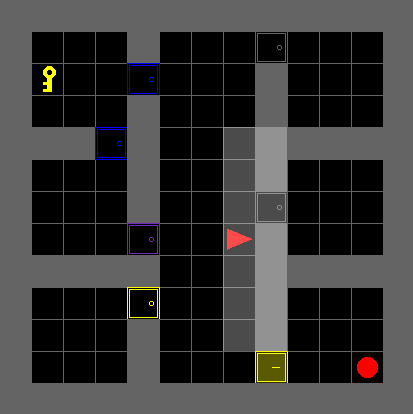 The agent must navigate in a maze composed of four rooms interconnected by 4 gaps in the walls. 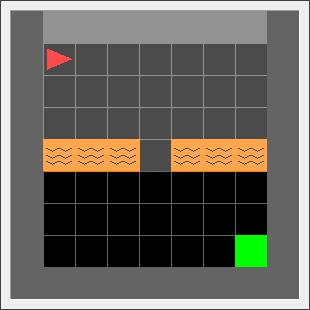 To obtain a reward, the agent must reach the green goal square. 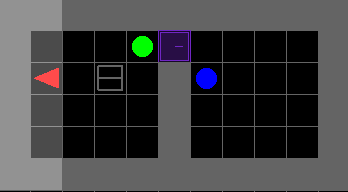 Both the agent and the goal square are randomly placed in any of the four rooms. 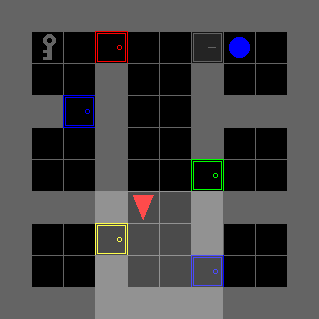 This environment has a key that the agent must pick up in order to unlock a goal and then get to the green goal square. This environment is difficult, because of the sparse reward, to solve using classical RL algorithms. It is useful to experiment with curiosity or curriculum learning. 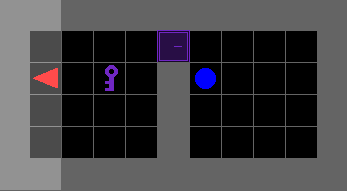 This environment has a series of connected rooms with doors that must be opened in order to get to the next room. The final room has the green goal square the agent must get to. 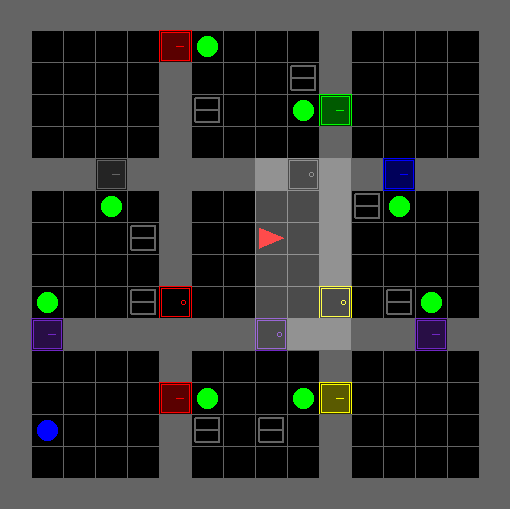 This environment is extremely difficult to solve using RL alone. However, by gradually increasing the number of rooms and building a curriculum, the environment can be solved. 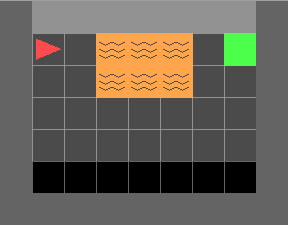 This environment has multiple objects of assorted types and colors. The agent receives a textual string as part of its observation telling it which object to pick up. Picking up the wrong object produces a negative reward. 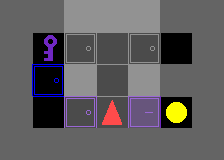 This environment is a room with four doors, one on each wall. 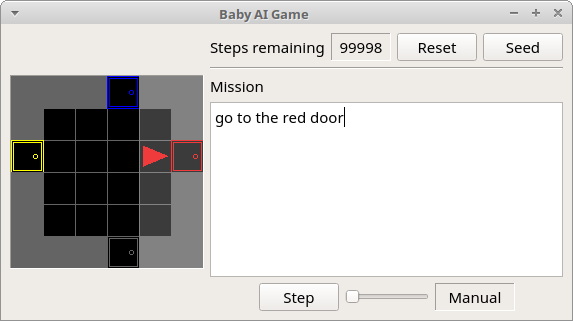 The agent receives a textual (mission) string as input, telling it which door to go to, (eg: "go to the red door"). It receives a positive reward for performing the done action next to the correct door, as indicated in the mission string. The agent is instructed through a textual string to pick up an object and place it next to another object. This environment is easy to solve with two objects, but difficult to solve with more, as it involves both textual understanding and spatial reasoning involving multiple objects. The purpose of this environment is to test memory. 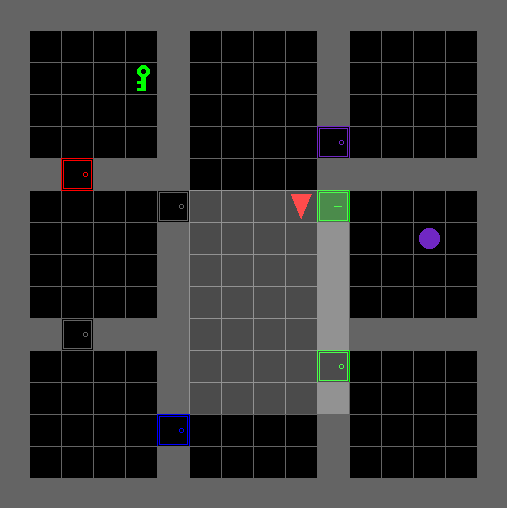 The agent is randomly placed within a room with one red and one blue door facing opposite directions. The agent has to open the red door and then open the blue door, in that order. The agent, when facing one door, cannot see the door behind him. Hence, the agent needs to remember whether or not he has previously opened the other door in order to reliably succeed at completing the task. This environment is a memory test. The agent starts in a small room where it sees an object. It then has to go through a narrow hallway which ends in a split. 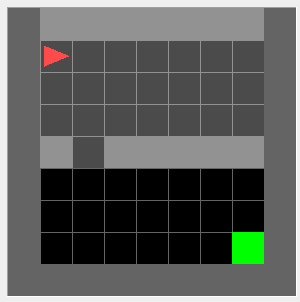 At each end of the split there is an object, one of which is the same as the object in the starting room. The agent has to remember the initial object, and go to the matching object at split. 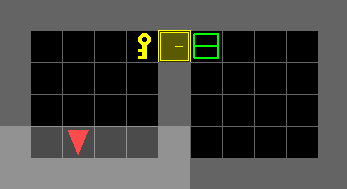 The environment has six rooms, one of which is locked. The agent receives a textual mission string as input, telling it which room to go to in order to get the key that opens the locked room. It then has to go into the locked room in order to reach the final goal. 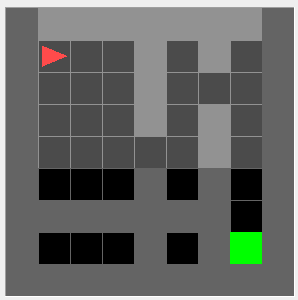 This environment is extremely difficult to solve with vanilla reinforcement learning alone. This environment is similar to the locked room environment, but there are multiple registered environment configurations of increasing size, making it easier to use curriculum learning to train an agent to solve it. The agent has to pick up an object which is behind a locked door. 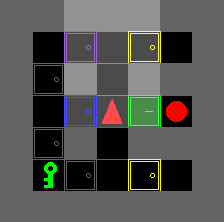 The key is hidden in another room, and the agent has to explore the environment to find it. The mission string does not give the agent any clues as to where the key is placed. This environment can be solved without relying on language. The agent has to open a locked door. This environment can be solved without relying on language. The agent has to pick up a box which is placed in another room, behind a locked door. This environment can be solved without relying on language. The agent has to pick up a box which is placed in another room, behind a locked door. 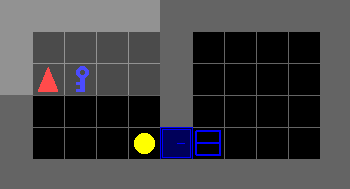 The door is also blocked by a ball which the agent has to move before it can unlock the door. Hence, the agent has to learn to move the ball, pick up the key, open the door and pick up the object in the other room. This environment can be solved without relying on language. 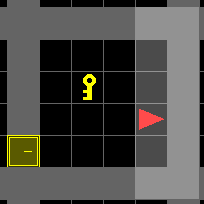 The agent has to pick up a box which is placed in a corner of a 3x3 maze. The doors are locked, the keys are hidden in boxes and doors are obstructed by balls. This environment can be solved without relying on language. 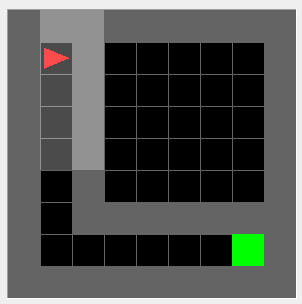 The agent has to reach the green goal square on the other corner of the room while avoiding rivers of deadly lava which terminate the episode in failure. 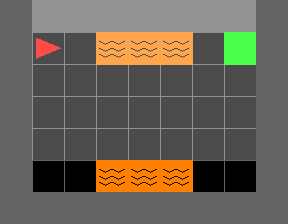 Each lava stream runs across the room either horizontally or vertically, and has a single crossing point which can be safely used; Luckily, a path to the goal is guaranteed to exist. This environment is useful for studying safety and safe exploration. 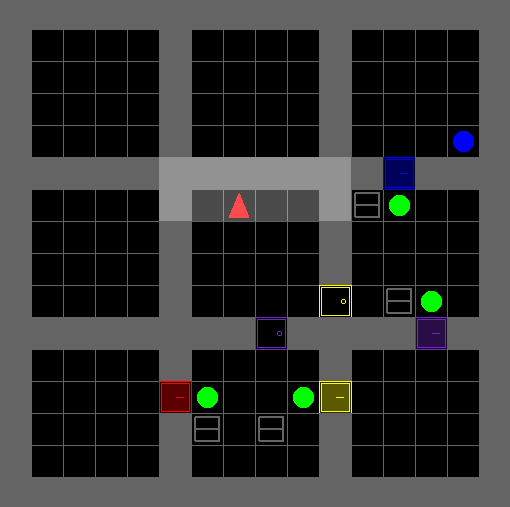 This environment is based on one of the DeepMind AI safety gridworlds. 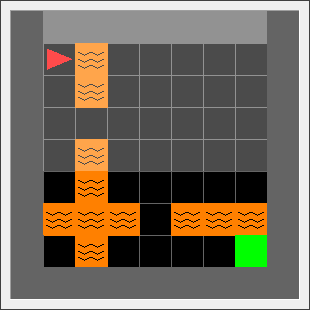 The agent starts in the top-left corner and must reach the goal which is in the top-right corner, but has to avoid stepping into lava on its way. The aim of this environment is to test an agent's ability to generalize. There are two slightly different variants of the environment, so that the agent can be trained on one variant and tested on the other. 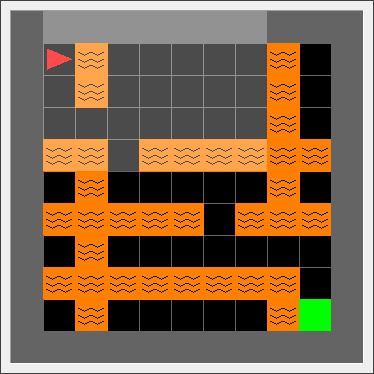 Similar to the LavaCrossing environment, the agent has to reach the green goal square on the other corner of the room, however lava is replaced by walls. This MDP is therefore much easier and and maybe useful for quickly testing your algorithms. This environment is an empty room with moving obstacles. The goal of the agent is to reach the green goal square without colliding with any obstacle. A large penalty is subtracted if the agent collides with an obstacle and the episode finishes. 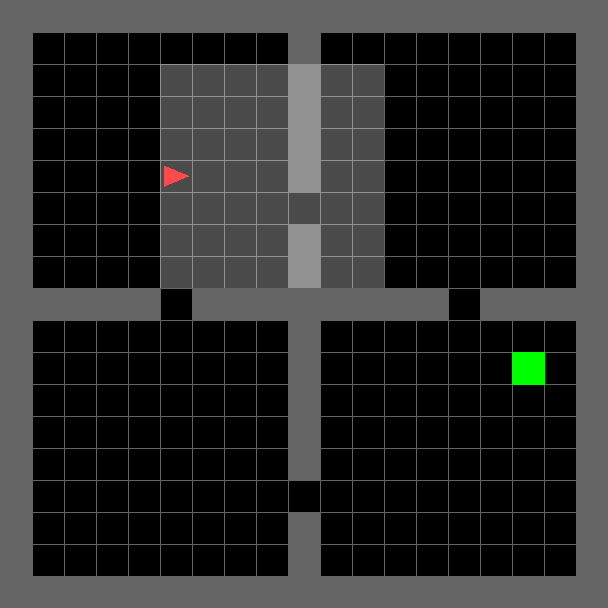 This environment is useful to test Dynamic Obstacle Avoidance for mobile robots with Reinforcement Learning in Partial Observability.